In the face of increased market pressure, Thai rice farmers have taken their competition from the vast rice fields to the worldwide web. For as little as 30 baht (less than US$1) per kilogram, you can now order a bag of rice from a farmer online and have it delivered directly to your doorstep. This recently launched no-frills online agricultural market, run by the Thailand’s Ministry of Commerce, represents the hope and future of the country’s rice producers. There’s even a special launch offer: free delivery for the first four months, courtesy of DHL eCommerce. As an economy that runs on rice, half of the country’s workforce is involved in rice production in a certain capacity. In fact, rice from Thailand alone makes up around 20% of the world’s dietary energy supply and if Thai rice farmers fail to sustain their sales and operations, the livelihoods of plenty of people would be at stake. If you can build a user-friendly shopfront and integrate it with robust, flexible logistics options, you can sell anything online — even rice. 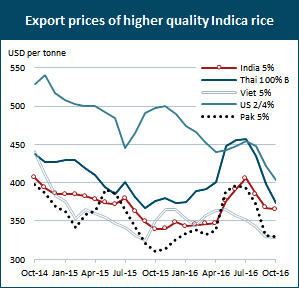 Surplus production drove rice prices down significantly in the latter half of 2016. When it ultimately reached new lows in October, the Thai government stepped in with loans and other support measures ­­— including some inspiration from this growing industry. With support from The Ministry of Commerce, DHL eCommerce and local e-commerce platform BentoWeb, rice co-operatives across the country receive help with setting up basic online inventory, shipping, and their e-commerce stores on the ThaiTrade website. The stores, which run on BentoWeb, come fully-integrated with the customer web portal offered by DHL eCommerce, allowing the farmers to see and manage their deliveries with just a few clicks. “E-commerce has allowed Thai retailers to have direct access to local customers far more quickly and cost-efficiently than they could’ve before,” Kiattichai Pitpreecha, Managing Director, DHL eCommerce Thailand explains. “It makes sense to apply the same approach to one of the country’s biggest and most culturally significant industries.” And until March 2017, each of those shipments will travel for free to anywhere in the country, in a bid to kick-start the harvest for the co-operatives involved. “Free deliveries should create an added incentive for new buyers and sellers to come on board — and help tide farmers over until their e-commerce channel gains traction,” Pitpreecha added. If their early forays into e-commerce prove successful, Thailand’s rice farmers could find themselves with a bountiful new crop of profits, largely from greater direct access to a wider pool of customers across the country. And the reduced overheads of direct online sales could insure farmers against further price drops and make the industry more sustainable as a whole.